Low, Abby Clawson. New York, NY: Clarkson Potter Publishers, 2018. First Edition. 8vo. Pictorial Wrappers. Travel Guide. As New. 304pp, profusely illustrated in color and b&w. Abby Clawson Low is a design director specializing in identity and publication design. Her studio projects range from logos, websites, and books to self-published projects and collaborations - including work for The New York Times Magazine, Kid O products, Madewell, New York magazine, Abrams Books, Melcher Media, Partners & Spade, Mayle, Seersucker, CHANCE, and Harvey Faircloth. This gorgeous travel and look book is a love letter to Mexico City that celebrates in photographs and descriptive text the cultural, architectural, design, art, and culinary destinations in this extremely popular and vibrant destination. Vast and exciting, Mexico City has so much to offer for both tourists and locals. 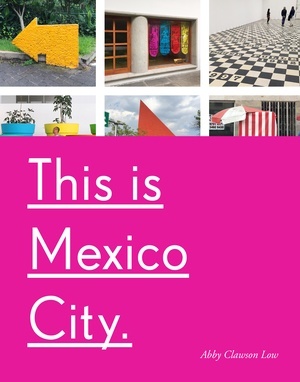 "This Is Mexico City" is a visual and descriptive guide with an emphasis on design, art, architecture, and culture, showcasing the best museums (both traditional and off-the-beaten-path), old-school mercados, public art, locals’ favorite restaurants - from the fancy to the food trucks, and more. This lifestyle-driven city tour will captivate Mexico City’s residents, future and past visitors, and even armchair travelers. A brand new, pristine example.